100% NON-STICK: Improve your barbeque experience and your grill mess-free. No need to use OILS or FATS ever again, heavy duty grill mat surface making your food tastier and much healthier. 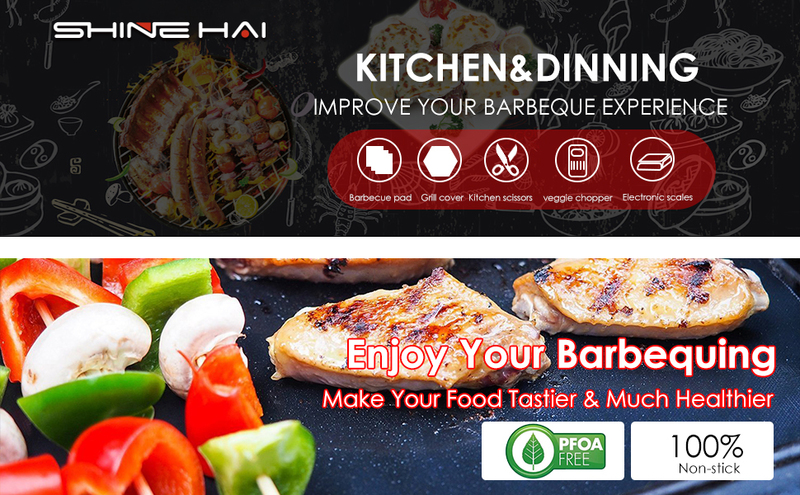 Reliable Quality: Our BBQ grill mats are made from 100% PFOA-Free materials and premium 100% PTFE-Fiber glass coating (thin for better heating), no harm to human health and are approved by FDA and safe for using on the top shelf of your dishwasher. 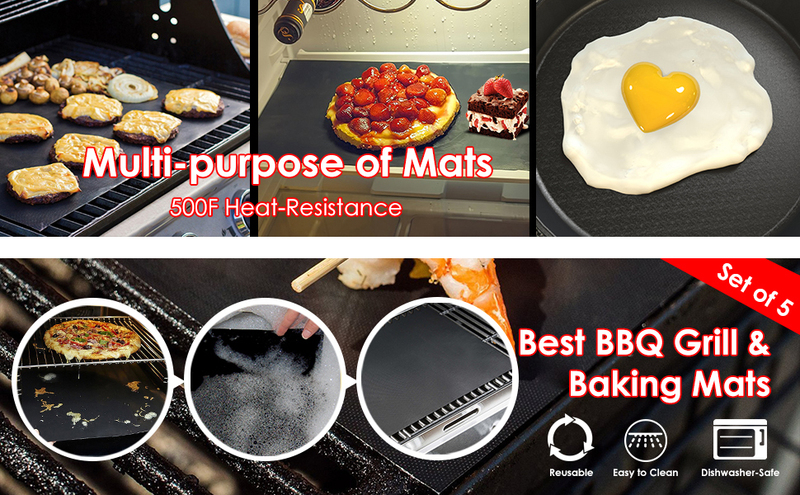 500F Heat-Resistance: These barbecue cooking mats which are made of heat-resistant technologically advanced materials that look similar to a plastic mat but will not burn. These mats are heat resistant up to 500 degrees Fahrenheit. Multipurpose: Works with any kind of barbecue grill - Weber, Charbroil, Big Green Egg, smoker, charcoal, propane, gas, or electric. Better than any grill pan or basket, our mat can be cut to any size or shape to fit any need. Also doubles as a bake mat. [Set of 5 Reusable Grill Mats] Stop wasting money on aluminum foil or other disposable grill covers. Grill your meat, vegetables, fish, shrimp, pizza, kabobs, even pancakes, bacon and eggs without using cooking oil! The mat sits right over your grill grates preventing your food from falling through the cracks! Frequent grillers know all about the inconveniences of backyard barbecuing. Food sticks to the grill, small pieces fall through the gaps, and marinades get lost to the flames. But it doesn't have to be that way. The SHINE HAI Grill Mats is a griller's new best friend. It's a flexible fabric mat with a 100% nonstick surface that can withstand heat up to 500 degrees Fahrenheit. The reusable mat works as an alternative to aluminum foil or parchment paper. Food doesn't stick to it, so you can use less oil in your cooking. They are totally washable and reusable. Almost like a thin, flexible pan, they are made from fiberglass fabric coated PTFE (Teflon) similar to what is used for non-stick pots and pans. This means that you can cook without oils, and cleaning up is simple because everything will slide right off. POFA-FREE: The Grill Mat is multifunctional and is equally impressive in the kitchen, as a baking sheet or as a liner for ovens and microwaves. For larger grills you can use multiple mats, side by side, and for larger meals, you can even flip one over to keep on cooking with the clean side up to preserve flavors. Anything else you want to put on the grill! After each use, cleanup is simple. Just wipe the double-sided mat clean with warm, soapy water, and it won't hold onto any food odors. Also it is safe for using on the top shelf of your dishwasher. A package will last many years with proper care.